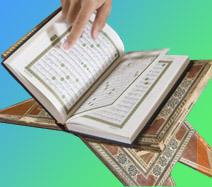 "So remind, by the Quran"
The Holy Quran is the message of our Creator to all the human beings. Quranic themes have perpetual and general attraction for everyone regardless of time, place and age. It talks about everlasting issues and universal themes with its persuasive appeal showing a straight path to eternal success. The attraction and effectiveness of the Holy Quran's own words are incomparable and our effort is to collect its verses on different topics. It is for everyboby who wants to know about himself, who wants to understand Islam using the Holy Quran and for those who preach Islam and deliver lectures on different topics of the Holy Quran. O People! who hear, see and think . . These are the topics of the Book . . . . . .
That changed the world. . . in just 23 years.